Just like our regular knit hats, our designer style cable knit cashmere hats were created exclusively for The Pashmina Store and our customers who demand both quality and value in their fashion accessories. 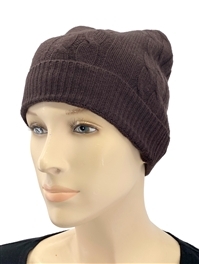 Made in Nepal using fine quality soft and warm, 4-Ply pure cashmere pashmina wool, our Dark Chocolate brown cable knit cashmere hats are a touch more plush and warm than a typical knit hat. They are also more distinctive for those who appreciate uniqueness. Each one-size-fits-all hat is produced and inspected by expert Nepali artisans to ensure you a quality fashion accessory that will stand up to the demands of your daily life. Simply add this dark chocolate brown cashmere hat to your closet and you will be ready to look fashionable and stay comfortable every time you step out into even the coldest weather. Free standard shipping! Expedited shipping is available.